Russian low-fares carrier Pobeda Airlines (an Aeroflot subsidiary), inaugurated last December, started selling tickets to its first international destination on November 12. On December 19, Pobeda will launch a daily service to Bratislava (Slovakia) from Moscow Vnukovo Airport. GIven that Bratislava is located only 60 km away from Vienna, Pobeda also offers a Fly&Bus service, which includes an airport shuttle bus connection ride to the Austrian capital similarly to the scheme offered by Ryanair, which has the greatest presence at Bratislava. It is fairly possible that Pobeda will take a portion of current passengers from its parent company Aeroflot, which operates 14 weekly flights to Vienna‘s Schwechat International Airport. Aeroflot suspended services between Moscow and Bratislava in May 2010, citing high competition posed by its traffic on the Moscow-Vienna route. In April 2015, Russia‘s UTair Aviation stopped its Moscow-Bratislava service after 3.5 years of operations. Like with Pobeda‘s other city pairs, the minimum airfare on the Moscow-Bratislava route stands at 999 rubles (around $15), inclusive of all taxes and charges. According to Russian news agency RBC, no more than two seats per flight will be sold at this price. Business daily Vedomosti reports that there will be more such seats available. In particular, 20 minimum-price tickets were put up for sale for the inaugural flight to Bratislava. 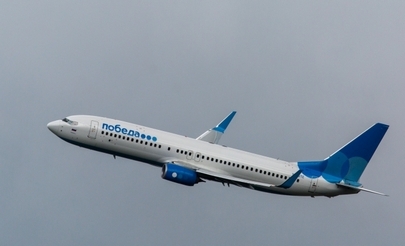 Pobeda gained access to international routes shortly after the Russian Transport Ministry exempted carriers whose parent companies were already allowed to operate international flights from the requirement to serve the domestic market for two years before applying for international city pairs. This exemption enabled Pobeda to start flying to the western exclave of Kaliningrad. The Russian aviation authorities have also cleared the airline to operate services to to Dresden, Cologne, Bergamo, Verona, Salzburg and Chambery. Pobeda will inaugurate at least two more international routes before year-end. According to Vedomosti, the carrier is also interested in Belarus’s capital city of Minsk. The company has been reportedly unable to obtain slots at Minsk airport, however, and believes the local handling prices to be too steep. Pobeda currently serves more than 20 city pairs domestically. It operates 12 Boeing 737-800 narrowbodies in an all-economy 189-seat configuration.